Lovely teddys from the Steiff Baby collection, soft and safe for your child. To give with love, a friend forever for your baby. The wonderfull collection baby teddy's, all made of soft plush, embroidered eyes and machine washable at 30 degree C. All have the CE mark for safe toys. Steiff Sleep well bear pink, 25cm. 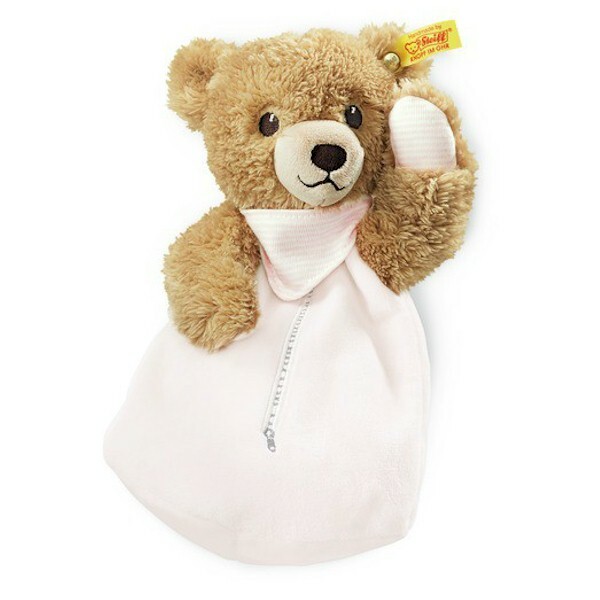 Steiff Baby EAN 239526 Sleep well bear pink, 25cm. 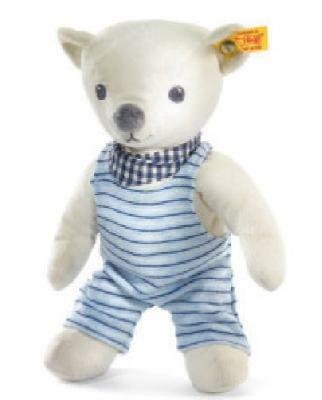 This Steiff teddy bear is 25 cm. 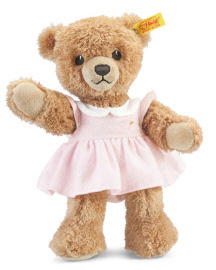 / 10" tall and made out of brown super soft plush and dressed in a pink dress. 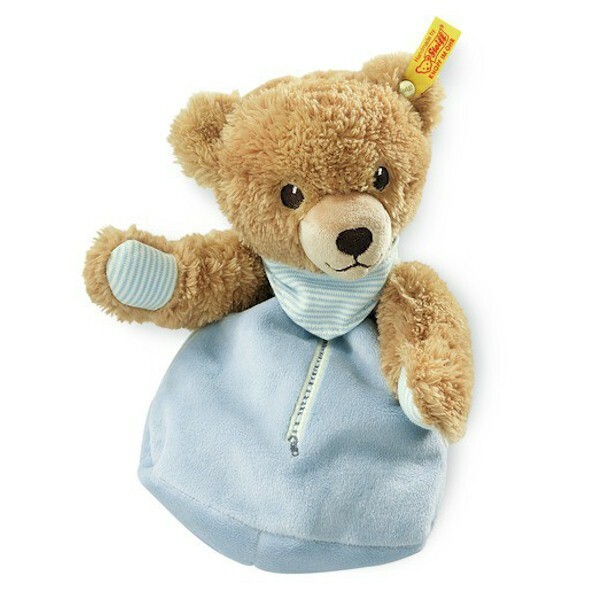 Steiff EAN 238123 Teddy baby girl, 20cm. Teddy baby girl is made of soft pink with white cotton. She has embroidered eyes and is filled with synthetic stuffing material. 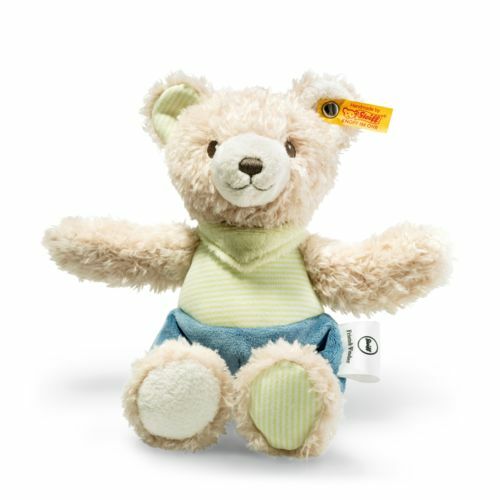 With CE mark for safe toys and machine washable at 30 degrees C.
Teddy with rustling foil is made of cream/green/petrol plush for baby soft skin. He has embroidered eyes, is machine washable at 30°C ans stuffed with synthetic filling material. He has a stainless steel “Button in Ear”. Teddy can be registrated at: www.code-no.com/steiff den Knister-Teddybär. So if he gets lost, his finder can put the code there also so Teddy could come back to you. 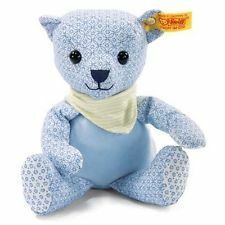 Steiff EAN 240669 Mini Teddy grip toy, 11cm. 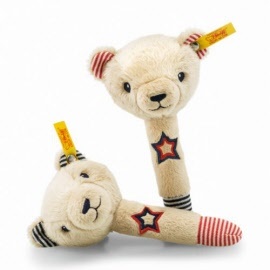 This Steiff animal is 11 cm. / 4.4" tall and made out of brown baby-soft skin plush. Steiff Baby EAN 239885 Sleep well bear pink heat cushion, 22cm. Sleep well bear pink wiht heat cushion. She is made of brown and pink cuddly soft plush and stuffed with synthetic filling material and pellets. In her belly she has a removable cherry pit pillow. She is with safety eyes and mashine washable at 30 degree C (cherry pit pillow not washable). She has the CE mark of safe toys for baby and small children. 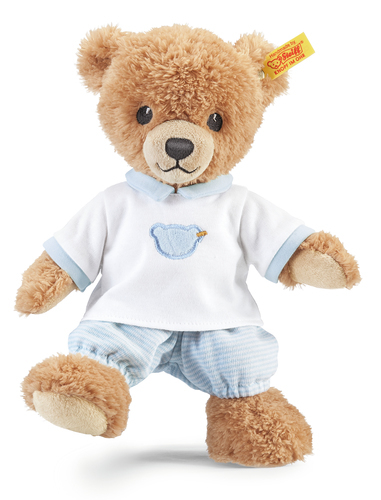 Steiff EAN 239908 Sleep well bear, 25cm. 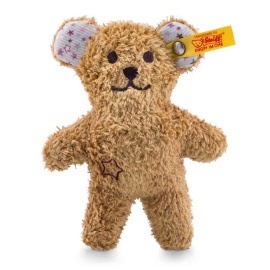 This Steiff teddy bear is 25 cm. 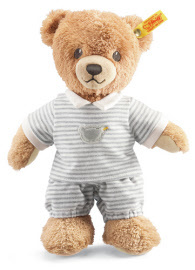 / 10" tall and made out of brown super soft plush and dressed in a grey/white outfit.